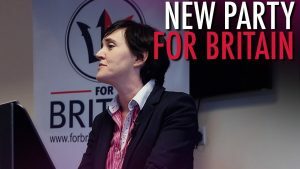 Writing exclusively for AltNewsMedia, the leader of the “For Britain” party Anne Marie Waters provides her take on the latest developments with Brexit and the EU. The European Union, in a pronouncement that should surprise no one, has made clear its requirement for future British governments to be bound by any Brexit deal – the terms cannot be renegotiated by future leaders. Not only does this raise internal constitutional questions for the UK, but it reveals the intent and expectation of the EU; now and in the future. I’ve long argued that getting out of the European Union is not enough, it will continue to punish us for as long as it can. We must pursue Brexit with all the energy we have, but true liberty in Europe can only be recovered if the EU itself ceases to exist. The Brussels bureaucracy has shown time and again that it has no time for the will of the people, because it is a top-down, big-state idea and dissenters are to be shamed, usually with accusations of racism or ‘hate’. It is a characteristic straight out of ‘Communism 101’. Even if we were to make a clean break, this authoritarian beast will still be on our doorstep, still making demands, and the remain camp here in Britain will be more than happy to lend them a hand. The Brexit debate rarely moves on with any significance, but this latest requirement of EU chief negotiator Michel Barnier confirms that the EU still sees itself as a having a right to say in Britain’s affairs. That won’t change, with or without Brexit. It is looking increasingly possible that a ‘no deal’ Brexit may be the outcome. The problem is of course that the EU’s ‘red lines’ are exactly what the British public won’t allow Theresa May to concede on. The sticking points are the single market and the customs union. The single market comes with free movement of people (it doesn’t have to, but the EU demands it in order to weaken the individual nation-state). Free movement of people means open border mass immigration from all corners of the world, and the people of Britain (or elsewhere) will have no way of stopping it. Back in 1975, when the UK voted to remain in the EEC, many on the Left opposed the single market, including major trade unions, because they understood the impact it would have on the British working class. That impact remains, the difference is that the Left no longer cares. A whole new wave of voters (and low wage workers and Labour voting benefit-dependents) has been imported to Europe and the white working class has been thrown to the wolves, expected to collect their punishment for having been born in the West with white skin. If free movement is part of any deal, then Brexit has not been achieved and should not be accepted. The second sticking point is the customs union. This provides tariff-free movement of goods throughout the member states, and pan-Europe customs on external imports. The small print however contains the condition that to be in the customs union is to accept the EU as our trade negotiator. In other words, if we stay in the customs union, we cannot trade with the rest of the world as we see fit. Like the single market, if we stay in the customs union, Brexit has not been achieved and should not be accepted. Typical of those who would align with top-down big-state governance, some politicians in Britain openly deride their electorate and unashamedly let them know what a bad decision they’ve made. They believe they should now step in and save us all from ourselves. They do so in appropriate Orwellian style by calling for a second referendum while disguising it as a ‘people’s vote’. It is increasingly clear to me and to others that we are engaged in that eternal battle between freedom and serfdom. Whether the state ought to fear the people or the people fear the state is once again on the table. The big state has power of course but there is an awakening of liberty and nation-state democracy throughout the Western world. The majority have been abandoned across Europe and they need to reminded of their power, before it is gone altogether. That is where For Britain steps in, and steps up to the plate. At our first national conference later this week, we will outline the policies that we need to strengthen the cause of freedom and democracy. We have the ideas, we have the answers, and we have the determination to persevere against enormous odds and obstacles. We will do what needs to be done, and as always, we will do it For Britain.